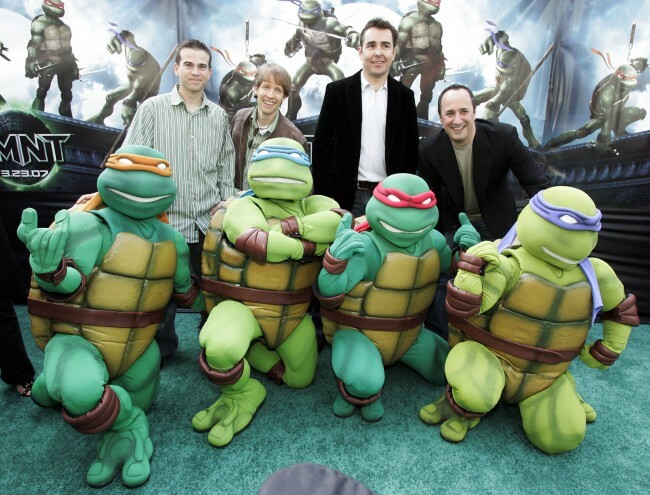 Voice actors, from top left, Mikey Kelley, James Arnold Taylor, Nolan North and Mitchell Whitfield pose behind their Teenage Mutant Ninja Turtles characters, from left, Michelangelo, Leonardo, Raphael and Donatello, as they arrive at the premiere of the Warner Bros. feature “TMNT,” the latest installment of the Teenage Mutant Turtles saga, at Grauman’s Chinese Theatre in Los Angeles Saturday, March 17, 2007. ONCE upon a time, we had the Teenage Mutant Hero Turtles on British TV because on these shores, everyone is far too chicken to use the word ‘ninja’. Mercifully, times have changed and now, we’re all set for a brand new Teenage Mutant Ninja Turtles film. And the new trailer for it has been released. Of course, there’s only one man childish enough to have fun make a TMNT film, and that’s Michael Bay, who also rummaged through the toybox in his mind to direct the Transformers films. So how are Raphael, Michelangelo, Donatello, and Leonardo looking? Naturally, it is a CGIfest with some live action and it stars Megan Fox, which is perfect for those masturbators who have the same preference in women as 13 year old boys. Someone called William Fichtner plays the super nasty baddie, Shredder and there are some other people in it, but they’re not furiously famous. Not that anyone will really mind, provided there are some kung fu kicks and pizza jokes. The new film is released in the US on May 16, and in the UK on June 6.